Adverbial phrase meaning: about, concerning, in regard to, as to/far, of. It becomes ni tsuite no when modifying a noun. Dare no koto ni tsuite hanashite iru n desu ka. 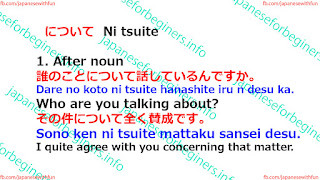 Sono ken ni tsuite mattaku sansei desu. I quite agree with you concerning that matter. Nihongo kyouiku ni tsuite takusan mondai ga aru. 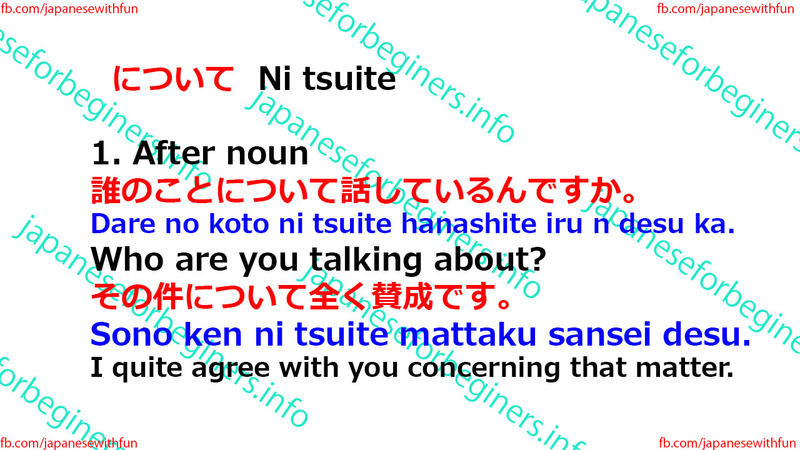 There are many problems with Japanese language education. Nihon no seiji ni tsuite dou omoimasu ka. What do you think of Japanese politics? Engeki ni tsuite no shiryou wa arimasen deshita. There was no data concerning Theatre.